You know the feeling: Your throat gets a little sore, your nose might start dripping and you feel abnormally tired. In other words, you’re getting sick. So what do you do when a cold or the flu comes knocking? Here are eight steps to take the moment you feel sick. When you feel an illness coming on, it’s important to take stock of your symptoms. 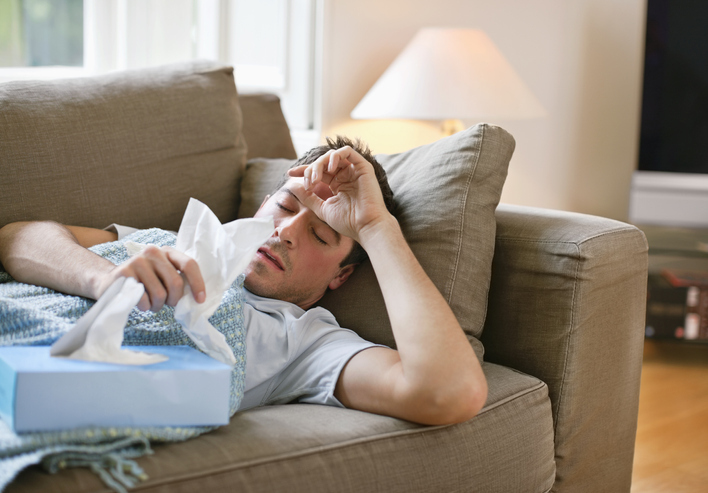 A cold virus might come with a stuffy nose, sore throat, coughing, sneezing and mild fatigue, according to Healthline. But the flu can bring on a hacking cough, high fever and severe body aches and chills. Unless you’re in a high-risk group — such as young children, seniors and those with weakened immune systems — you probably can ride out a minor cold on your own. But you might want to consult with a doctor if you’re experiencing flu symptoms. You know your body best, so it’s important to gauge your symptoms right away to be proactive about your treatment. Drinking lots of fluids is one of the best weapons against a cold. When you’re sick, you risk becoming dehydrated as your body produces mucus or runs a fever. Plus, you might not necessarily want to drink much if you have a sore throat, which also could lead to dehydration. But ample hydration will make you better faster. “Water, juice, clear broth or warm lemon water with honey helps loosen congestion and prevents dehydration,” according to Mayo Clinic. Just be sure to avoid alcohol and caffeinated beverages, which may dehydrate you. Getting enough rest when you’re sick might seem obvious, but many people try to power through their symptoms at the start of an illness. And that might just make you sicker in the long run. So as soon as you start experiencing symptoms, allow your body to rest, even if you feel like you could keep going through your normal routine. One day of proactive rest could be the difference between your initial symptoms never getting any worse and you being bedridden with a nasty cold for a week. A stuffy nose is never fun. Even though we can get enough oxygen through our mouths, losing nasal breathing to congestion still makes us feel uncomfortable. Plus, if congestion doesn’t drain, it might turn into a worse infection that could require antibiotics. So it’s important to help your body drain that mucus. Mayo Clinic recommends nasal drops or sprays to relieve a stuffy nose. Or sip on some warm liquids, such as herbal tea or broth, to help break up the mucus. There’s an old myth about fighting viruses that goes, “Feed a cold; starve a fever.” The thinking is eating when you have a cold allows the body to generate warmth, but avoiding food when you have a fever helps it cool down. But medical science disagrees. In reality, you should feed your body with healthy foods no matter what, according to Harvard Medical School. Even if you don’t have much of an appetite when you’re fighting a virus, your body still needs plenty of nutrients to get you better faster. The chillier months of the year mark cold and flu season. 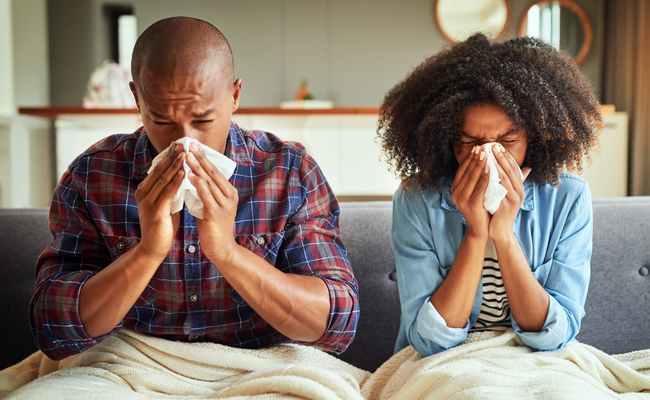 Not only are more people clustered inside together swapping germs, but cold and flu viruses tend to survive best at cooler temperatures and low humidity. 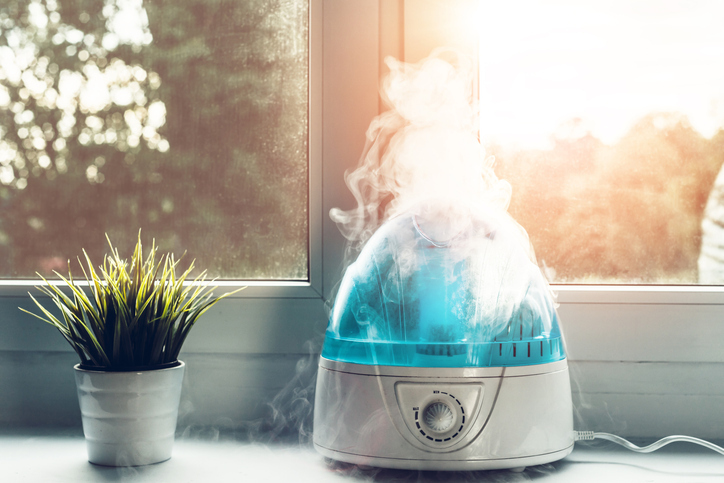 So if you feel a bug coming on, Mayo Clinic suggests adding some humidity to your air with a vaporizer or humidifier. This can loosen congestion and help your nasal passages better fight infection. Just don’t forget to change the water daily and follow your appliance instructions. Drinking warm liquids and using a humidifier are just some natural remedies that you can try the moment you feel a virus coming on. Mayo Clinic also recommends gargling with saltwater — “1/4 to 1/2 teaspoon salt dissolved in an 8-ounce glass of warm water” — to soothe a sore throat. Plus, other remedies — including zinc, vitamin C and echinacea — may help to prevent viruses or lessen their symptoms, though studies on their effectiveness are mixed. It’s usually in your best interest to stay home, rest and avoid stress when you’re starting a virus. For one, your body will have a much easier time beating the virus if you allow it to relax, rather than further running it down. And your immune system will appreciate being removed from the germ pool when it’s already working in overdrive. Plus, it’s in everyone’s best interest not to keep spreading germs. “For colds, you are contagious the entire time you have symptoms, but you are most contagious right after you contract the viral infection, before you even have symptoms,” according to Harvard Medical School. “For the flu, adults are most infectious from the day before symptoms start until about the fifth day of symptoms.” So regardless of whether you feel sick or well, always practice good hygiene — wash your hands frequently, cover your mouth and nose when you cough or sneeze, etc. And as soon as you feel sick, consider it an invitation to take a break from the hustle of daily life and focus on yourself. I have bee, in and out of the upper respiratory illness since November 29. And I had a flu shot past October. Taking care by myself, but now I need to go to Doctor and ask for antibiotics.